The assassination of the Rev. Dr. Martin Luther King, Jr. on Thursday, April 4, 1968, changed this neighborhood forever. 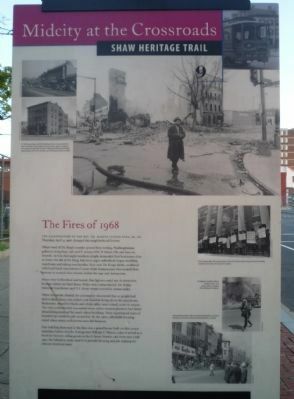 When word of Dr. King’s murder spread that evening, Washingtonians gathered along busy 14th and U streets, NW; H Street, NE; and here on Seventh. At first distraught residents simply demanded that businesses close to honor the life of Dr. King, but soon angry individuals began smashing storefronts and taking merchandise. Fury over Dr. King’s death, combined with local Black resentment of some White businessmen who treated their patrons as second-class citizens, fueled the rage and destruction. Stores were firebombed and looted. Firefighters could not do their jobs because rioters cut their hoses. Police were outnumbered. On Friday National Guardsmen and U.S. Army troops arrived to restore order. many of the area’s oldest buildings. 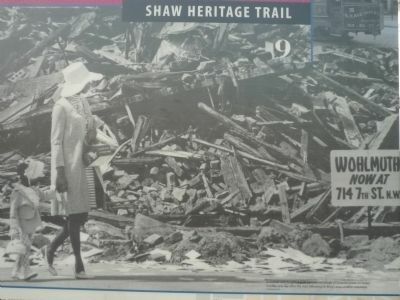 Shaw experienced years of boarded-up windows and vacant lots. By the 1980s, affordable housing stood where stores and taverns once did business. One building destroyed in the fires was a grand house built on this corner sometime before 1874 by fruit grower William F. Thyson. Later it served as a hotel for farmers selling goods at the O Street Market, and from 1920 to 1950 the Salvation Army used it to provide job training for African American men. Marker series. This marker is included in the Martin Luther King, Jr., and the Shaw Heritage Trail marker series. Location. 38° 54.593′ N, 77° 1.309′ W. Marker is in Shaw, District of Columbia, in Washington. 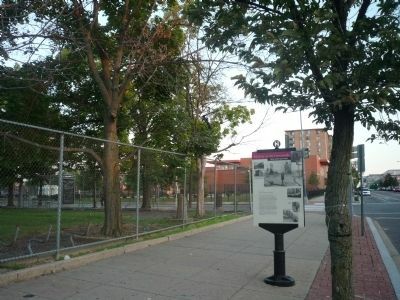 Marker is on 7th Street Northwest north of P Street Northwest, on the right when traveling north. Touch for map. Marker is in this post office area: Washington DC 20001, United States of America. Touch for directions. Other nearby markers. At least 8 other markers are within walking distance of this marker. Community Anchors (about 500 feet away, measured in a direct line); Spiritual Life (about 600 feet away); Working for the Race (about 700 feet away); Carter G. Woodson House (about 700 feet away); Alley Life (approx. 0.2 miles away); Immaculate Conception Catholic School (approx. 0.2 miles away); Immaculate Conception Catholic Church (approx. 0.2 miles away); Phyllis Wheatley YWCA (approx. 0.2 miles away). Touch for a list and map of all markers in Shaw. More. Search the internet for The Fires of 1968. Credits. This page was last revised on March 18, 2019. This page originally submitted on August 15, 2009, by Richard E. Miller of Oxon Hill, Maryland. This page has been viewed 1,220 times since then and 11 times this year. Last updated on March 8, 2019, by Devry Becker Jones of Washington, District of Columbia. Photos: 1, 2, 3. submitted on August 15, 2009, by Richard E. Miller of Oxon Hill, Maryland. • Bill Pfingsten was the editor who published this page.